Over the years, many people have asked me why we can’t publicly sell TAP cards featuring our local beloved sports teams. The reason is simply that we don’t have permission to use their names and logos. But no longer! There will be LAFC stickers above the screens showing which TVMs have these cards in stock. 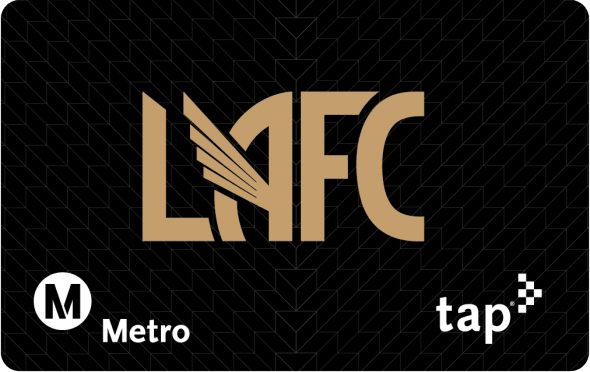 Don’t forget to Go Metro to the remaining LAFC games this season! They’re in a good position to lock down a playoff spot as the regular season draws to a close — no mean feat for a team in its inaugural season. Take the Expo Line to Expo Park/USC Station, or the Silver Line to the 37th Street Transitway Station. Metro Bus 81 to 39th/Figueroa is another option — the 81 runs between Eagle Rock, DTLA and South Los Angeles. As an added bonus for transit riding supporters: show your TAP card at any merchandise kiosk on game days or at LAFC HQ team store during store hours and receive a 10 percent discount on official LAFC hats! This should be a condition of any future MSRC grant. Let’s see those Dodgers TAP cards! why not have station editions where the art of the stations from the artists are produced? Math oriented cards like irregular polygons that tile the plane? How about city editions. Pasadena ones with City Hall in the background sold at Pasadena stations and outlets. Santa Monica ones with the pier sign sold in SaMo. Long Beach with the Queen Mary and the towers sold in the LBC. Watts Towers. There are several more cities. At Hollywood/Highland, they put the signs on the TVMs, but did not stock any TAP Cards. The signs therefore are a disingenuous generic TAP card sales tactic. This applies to both labeled TVMs at this station. There are approximately 1500 cards stocked at each location. Once they run out, they will not be restocked. If cards at Hollywood/Highland are already out, I’ll ask TAP staff to remove the stickers. Due to the number of stations that needed to be stocked, staff had to begin roll out last night. It’s possible some people realized they were already stocked and went to purchase some. We’ve also seen people purchasing multiple cards at once. We do our best to ensure everyone gets a fair chance to get the cards, but once the cards are out there it’s hard to predict which stations run out first. Stations that have a large number of users, like Hollywood and Highland, seem to run out of TAP cards sooner. They do need to do a better job of removing the stickers. The stickers for the Pride tap cards are still at Union Station TVM’s but they cards are sold out!! Thank you, we’ll request TAP staff remove the stickers as soon as possible. Got one 5am today. Very happy! And love the simplified design of the card’s backside. If the stickers above the screens have been removed, the cards are sold out at those stations. Sorry for any inconvenience.